We in northern climes often view winter as a time of purging the ills of the warmer months, disease, rot, allergens etc. And so, when I woke early this morning and found snow beginning to accumulate on our lawn’s grass I was delighted at the change in scene and chortled as I went from window to window to see what the different views displayed. 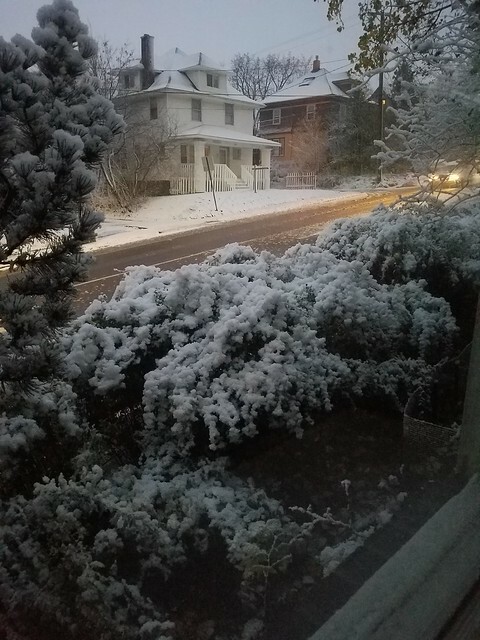 Claudia and I settled down to sip our coffee and watch the traffic along 21st Avenue, a snow tradition at our home, to see how the conditions were affecting the passing traffic. Not too bad. I hopped in the Traverse to drive to McDonalds for some egg sandwiches. I’d already read a half a dozen Friday articles about our schools and they reminded me of another kind of purge – the possible purge of the noxious myths of the Red Plan that have allowed exSuperintendent, Keith Dixon’s ghost, to rule the Duluth School Board for the past six years since he touchingly left Duluth – holding another $19 million bag of Red Plan doggy turds. My ailing foot is not about to go out today to pass out more literature. Fortunately, my team has scraped up enough to reach most voters without depending on my mobility. So, I will spend the morning pointing to the various sources that strongly argue for this second purge. 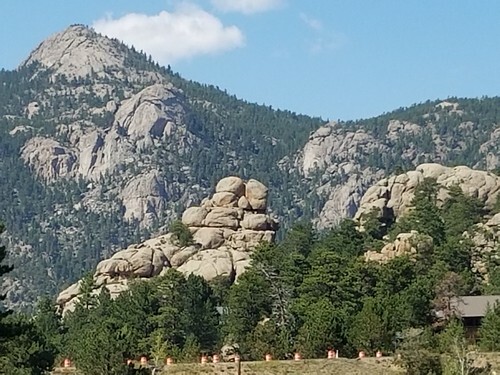 Welty family reunions have most often converged on Estes Park, Colorado in a valley surrounded by foothills and the Rockies. One of my first memories was seeing Damn Yankees at a Drive in Theater when I was ten or so. Love the scene with canibals putting missionaries in a soup pot. Ten years later we saw Anne of a Thousand Days in the tiny downtown theater. Its always been a tourist Mecca and even my cousins are astonished at its carpeting of new housing developments. The general level of material wealth is worth comparing to what I saw in China. 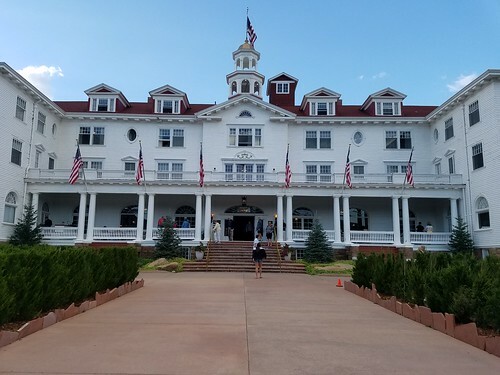 Even if China’s GNP overtakes that of the United States they won’t likely match such places at Estes which has a hundred years headstart in developing creature comforts. Much of what I’ve said of Estes could be said of Duluth as well at least as compared to China. Unlike the expanding Chinese Cities ours spread out into single family homes. The Chinese are expanding up as well but into apartment generic blocks. As with our trip to China a few weeks ago national news was hard to ignore. As always Seth Meyers is a wonderful antidote. I loved this piece of his. I also enjoyed Facebooking my weekend and appreciated my freedom to do so after being frozen out of Facebook while in China. Furthermore my reunion saw the first time that I wasn’t with my wife during our anniversary. Claudia was with two very handsome boys in the Dells and our anniversary communications were all Facebooked. I’ll be heading home in a couple hours and to a birthday party for one of those boys. 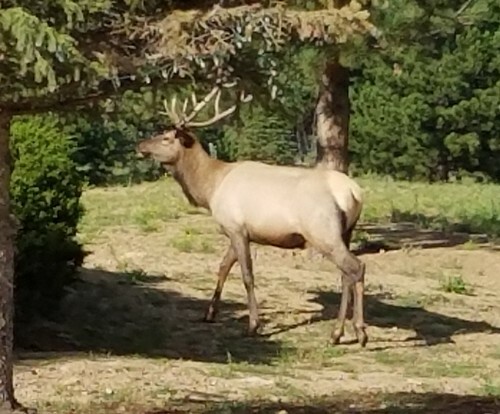 I’ll be taking him to the path of the total eclipse on Sunday and I bought eclipse sun glasses at the Visitors Center at Rocky Mountain National Park. Its been a busy August and from reports I got while in Colorado from back home School Board politics are heating up. I’ll start going door to door soon but I know that voters don’t pay much attention to local elections until Labor Day. At the end of the meeting one Board member interrupted a conversation that Mr. Frederickson, Alanna Oswald and I were having and told Spencer with dismissive authority that school’s were not responsible for children’s suicides. It was good to see the Trib’s Education reporter back covering yesterday’s Education Committee meeting. She’s back after having recently delivered a prospective new student for the Duluth Schools. The Trib’s story covers the critical issue of our Reserve funds which have shrunk to a week’s worth of cushion should we face financial calamity. That means we have one week’s worth of spending in the bank. If we have to cover an unexpected expense or even an expected expense we will have to borrow money and pay interest to our lender. Not good! When I was first on the School Board we had a year’s worth, not a week’s worth, of spending in our reserve fund. Ask yourself, as we board members will be asking ourselves, how we can address the concerns of our East High School teachers with so few resources available to alleviate their problem. The East building stewards are following up with a Meet and Confer that took place as the school year was starting. We continue to be concerned about class size at East and encourage you to review the data. Before school started on August 28th the Union Stewards at East hosted a Meet and Confer meeting with Superintendent Gronseth and Assistant Superintendent Starzecki regarding class size. Presently there are over 1,564 students enrolled for the 2015-2016 school year (as of 12/7/15). Throughout this process we have worked closely with our building administrator and were hopeful that additional FTE could be secured for East that would address the areas of concern. These areas are referred to as hot spots and highlight the overcrowded classes. As building stewards and classroom teachers we are advocating for smaller class sizes. Recently, math intervention courses were eliminated to use building FTE to reduce class sizes in math. The need for additional FTE to meet this need was brought up at the August meeting to avert having to cancel courses that could help reduce learning gaps. There continues to be a need for additional FTE and support at East where the enrollment is quite large. When the levy was passed one of the key focus areas was reducing class size. Our data from the last 5 years would indicate this has not happened at East. We encourage you to review the data and ask for your support to funnel funding into the classroom. Thank you for your time and commitment to serve as a school board member. Larger class sizes or disrupted scheduling in reaction to overloaded classes may drive student to PSEO or may make it more difficult to retain students in the margin (increasing our drop-out rate/widening the achievement gap). I’ve taken a break from regular blogging to refresh myself and to get my bearings for a soon-to-be new school board. I have explained previously that my commentary about other board members, especially my passing on their quotes or paraphrases, has led to hurt feelings and worse. I backed off from such commentary for about six months after winning my own election to the School Board in 2013 from November of that year until the following spring until I deduced that I was being treated less than fairly. I have also said that I was censured in December for my blogging and not for my premature disclosure of the Central selling price. By then my blog was a source of embarrassment for my fellow board mates. Although the new Board has yet to be seated I can assure my eight loyal readers that my early confidence in the new school board seems to be justified. I have met with one of the newly elected board members who was sort of keeping distance from me and we found much to compare notes about. School Board personalities and politics did not rear its ugly head, however, so that remains to be tested at a later date. There are many speed bumps ahead for the new board. I’ll post two such bumps following this. I’ll offer no answers because none will be easily available to us. The simple fact is that as tall as these bumps are they will be infinitely higher if we don’t have a sensible board. It is my strong belief that the next school board will focus on solutions to these difficult problems far more closely than the wounded egos of each member. Keep your fingers crossed that my prediction pans out. Better than a week ago I jotted down ten or twelve posts I wanted to write for my blog on a sheet of paper. Most of them were harmless but I’m torn between getting off to a good start with the new school board and getting things off my chest. This blog is my public diary and there is nothing I find more annoying than to go back to see that some detail of the past was not jotted down for posterity because I was on hiatus. That is particularly true of my first year fighting for a right to vote on the Red Plan and organizing Let Duluth Vote. I have only my current memories of those now distant events but I don’t have my thoughts of that moment. I’m often surprised to read what I wrote when I go back to old posts and I trust their accuracy more than my memory. I will say that I’m delighted that the two new board members I’ve not had a chance to meet with have generously agreed to meet with me soon. We’ve even set a date. I will probably not write about that meeting or what we discuss – at least not in any depth – because I meant what I told Dr. Kirby when I saw him campaigning at Chester Bowl last October. I told him that I expected that we would be “boon companions” should he be elected. I can’t blame him if he was skeptical of that prediction but I meant it. Not blogging about what we talk about is my stab at building up some trust between us. At my feet, as I type, is one of dozens of DNT clippings that I meant to blog about. Its the story from November 16th about shifting enrollments between area school districts. There are two new constants that the new school board must deal with. First, we’ve lost 15% of our enrollment (probably permanently) to other Districts since the Red Plan began to materialize. Second, we’ve dedicated roughly $10 million dollars which used to be available for the classroom from the local property tax levy to paying off building bonds. I have no objection to having the School Board shower Duluth with lots of positivity. But, I will not be a party to this positivity if we refuse to acknowledge the deep trench we dug for ourselves. If we are honest about that I will search for a good backhoe to fill the trench in. I need to file my latest clippings in my ever growing clipping file which I’ve been keeping for twenty years. I’ll get that and some other organizational work done today although I also have grandparenting duty. My oldest grandson came down with a fever yesterday and I will be hosting him for the day. He’s sitting in my comfy new rocker in the office reading at the moment. This weekend I’ll be heading down to the Twin Cities to participate in the Minnesota School Board’s delegate assembly. We will be looking through a couple hundred possible resolutions that once whittled down will form our wish list for the State legislature. Art Johnston and I have a resolution which would alter the law that seemingly gives school boards the arbitrary power to undo elections in order to rid themselves of unpopular school board members. I don’t think we will get our resolution passed this time around but we’ll offer it up again next year. Too bad we got so little snow yesterday. I actually have an idea for a snow sculpture. I think the children passing my home in their school buses will like it. In case any of my other eight loyal readers were wondering my Buddy sent me this question. Jeez, Harry. No comment for a week. Were you neutered by the recent election? Can’t a jabber mouth ever get a chance to shut up for a few days? I’ll hide behind either of them at the moment……Besides, I have lots of things to catch up on after knocking on thousands of doors for the past month. I went out and waved lawnsigns yesterday morning. It goes against my grain to do this no matter how much of an exhibitionist I appear to others. When I saw the Stauber family doing this a few elections back I had the sinking feeling that someday this would be expected of me too. I had other plans for the last day before elections too, leafleting a few missed cul-de-sacs, putting up unused lawnsigns some of which I’d begged for a week in advance of election day. Some were discovered hiding two days before the election. It took me until 2 PM to work up the enthusiasm to get to them. I was already spent from a furious last month of going door to door. A rough guess is that I visited between six and eight thousand doors. Toward the end I stopped knocking and just passed out flyers for my candidates. I don’t think I worked as tirelessly for myself two years ago. We’d been hearing reports for a few days of lawnsign theft. Alanna had one fellow tell her not to bother to give him a sign because he knew where a bunch of hers had been dumped. All he had to do was just go get one of the discards for himself. I hope we pick up the rest later. Alanna could use them again if she is disposed to run for reelection in four years. So I decided the least I could do was restore and improve upon the lawnsignage I’d put up along lower Woodland and 21st Ave leading down to the I-35 exit. Right now is a little about 7 AM on the day of the election. I will soon be heading out to make sure these signs survived the vandals last night. And no, if you were wondering. I never heard back from the police about that SUV that was stealing lawnsigns last week even though I gave them its licence plate number. This last year has been a nightmare. I felt the way Congressional Democrats must have felt when Newt Gingrich and the GOP took it upon themselves to impeach and remove President Bill Clinton for being a lying cad. At least the fellow I was supporting though his own impeachment was honorable. I think it is this, as much as anything else, which has made me a one man campaigning machine for the past month. I crave respectful congeniality and open and honest discussions when discussing the state of the Duluth Schools. For well over a year I’d been telling Art Johnston that our only hope for a sane and sensible school board would come with today’s election. As today’s date has come closer I’ve doubled and redoubled my efforts to make congeniality come to pass. Oh, congeniality won’t solve our problems. Duluth’s school board took ten million dollars from the classroom for the next twenty years to build “state of the art” (read vanity project) buildings. Cries for more teachers, more course offerings and more of everything else will not be solved by congeniality. What this Board needs is “grace under pressure” as Hemingway defined courage. It was a poem of advice to Kipling’s son who, by the way, was one of a million British boys killed in the First World War. Congeniality will not assure anything like courage but if paired with the latter our Duluth School Board might find itself becoming part of the solution for ISD 709 instead of being so much of the problem. Now go out and vote! 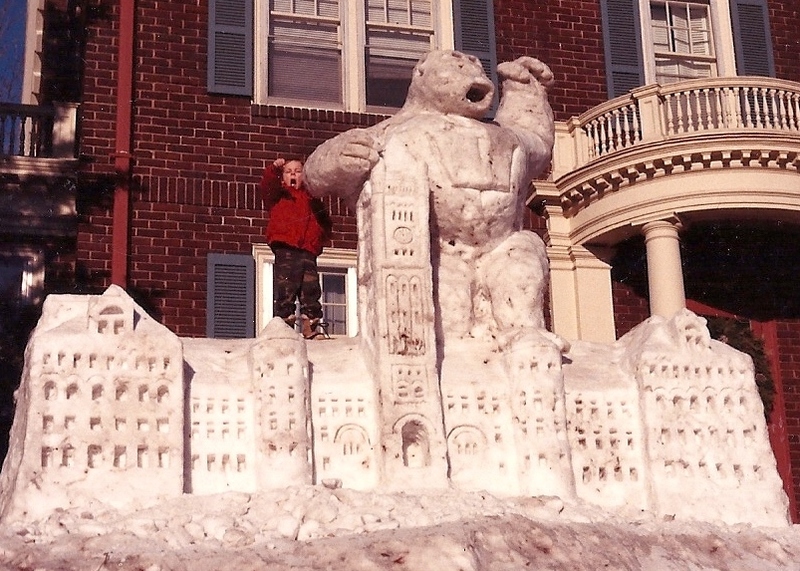 I was still smarting from having lost my first campaign for the school board in 1989 when I sculpted this out of snow. I would lose two more elections for the school board before finally winning a seat at the table. Back then the building was called the CAB or Central Administration Building. Today its called HOCH or Historical Old Central High. The sculpture suggests that there has been an air of controversy about the Duluth Schools for a very long time. The big fellow on top of Old Central I called Phil. The little fellow joining him in raising an angry fist is my son Robb, then all of five years old. That’s the same age as my grandson who stars in the preceding video. Today Robb is in this third year of a Doctoral program in Chemistry. Robb was never very happy about the attention I brought him as Duluth’s foremost snow sculptor and iconoclastic school board member. I don’t think his teachers ever punished him for being the son of a School Board member even when I got national attention for my voodoo stunt. But my school board work kept him in the spotlight from 4th grade until his graduation which he pointedly skipped because I was the one designated to hand him his diploma. I can hardly fathom that my previous record has been surpassed by recent events even if they have failed to draw national attention. The Trib’s photographer, Steve Kuchera, snapped an animated me at the school board meeting when our Board decided to kick Art Johnston off. Perhaps the singular difference between me and most school board members is that when calamity hits, say an imminent teacher’s strike, or a thousand angry parents rage against school closings, or a top hockey coach is about to be fired I’m not inclined to hide in a janitor’s closet. I blame my Mother who told me repeatedly when I was small not to cry when I skinned my knee because my Grandfather was shot in a war and he didn’t cry. In the meantime our students still melt away to other school districts. Our Western Schools have become the province of Free and Reduced lunches. We have overcrowded classrooms and diminished course offerings. No amount of happy talk will alter this. Replacing three people with their heads in the sand with three like-minded candidates is not what I would call a sure-fire recipe for success. The photo of my son with Phil on Old Central comes from the web page I set up to run for the school board two years ago. I haven’t looked at it until I googled “Harry Welty” last night and clicked the “images” option. I only promised one thing in that campaign – that I would practice a simple rule of thumb. “Honesty is the best policy.” I hope this blog has generally lived up to that standard. Duluth’s classrooms. There are three school board candidates I hope very much to have at my side as we go treasure hunting. I will be passing out flyers for them door-to-door this afternoon and tomorrow. Two days ago my cell phone’s pedometer told me I’d taken 32,000 steps passing out flyers. My 64-year old knees are pretty sore but as my Mom told me all those years ago – my Grandfather was shot and he didn’t cry. That’s not a record but its close. My head is so full of stuff to blog about it could explode. Instead I’m going to keep my fingers busy today passing out Obije and Oswald flyers. The thought of the School Board remaining in the hands of the crowd that gave us the last Godawful year keeps me awake at night. Eight hours of going door to door is the best narcotic know of to provide a good night’s sleep. I didn’t dose myself yesterday so I was up till 3AM tossing and turning. Heck, some of our possible new school board members refuse to meet with me. Two thirds of them are Rosie Loeffler-Kemp’s choices. I’d never heard of White before but I got sucked into watching the routine which ended with that pronouncement. It fit perfectly with the set up. It may very well fit with the Duluth School Board. I didn’t take it personally but got a good laugh out of it. However, White’s humor is not for the faint of heart so I won’t go linking to it. The board currently has a problem with transparency and isn’t welcoming to the public, Martell said. Among other steps, he called for agenda sessions to be open to the public, similar to the Duluth City Council’s sessions. See https://www.revisor.mn.gov/statutes/?id=13D.01, which pertains to meetings of public bodies in Minnesota. Has the Board ordained that its agenda sessions are not to be open to the public? I’ll let my friend read my reply here in the blog. For as long as I’ve been watching the Duluth School Board the Chair and Clerk have met with the Superintendent behind closed doors with his cabinet to set the agendas. Our policy used to guarantee that any subject that two board members wanted to discuss would automatically be placed on the agenda if they were given to the Chair about a week in advance. If agenda items were brought up at the meeting it required a unanimous vote at the meeting to be added. The Dixon led Board changed this preventing minority members from placing anything on the agenda in advance or at the last minute. If this is not illegal it is, as Loren Martell says, lacking in transparency. Is such a meeting for agenda setting purposes required to be open? Again, I don’t know. Any meetings of a quorum of the School Board must be open unless they involve private student data or personnel issues which are required to be kept secret. We had such a closed meeting yesterday. As I read the statute I see a likely exception when the Superintendent and his cabinet meet with less than a quorum of the Board for whatever reason. On the other hand I remember bitterly learning that my intentional exclusion a year and a half ago from a meeting by management to consider the teacher’s contract was illegal at a Minnesota School Board Association meeting. Whether the law that my friend sent me has been violated for twenty years is uncertain. That it keeps the District’s business secret from not only the public but from elected members of the school board is without question. Loren is absolutely right about that. If you are never told what’s wrong you sure as Hell won’t be able to fix stupid. I was glad to see that Art Johnston finally replied to the last news reports about his laying aside his lawsuit against the School Board. No one wants to see this old story drag out any more than Art or me. Its been an embarrassment and given everyone a black eye. I know Art had to tinker with the letter as he negotiated with the Editors until they could find no grounds to refute what Art wrote. While the editors would probably not agree with Art’s thoughts in their entirety neither would the Trib have published them unless they met their journalistic standards. That assures Art’s letter real credibility. For my part I fully agree with what Art has written. The letter got a pretty good spot today on what will become a busy letters page. The opinion page will fairly burst with testimonials for the various candidates until November 3rd’s election. The letter also had a headline that will assure it gets read. It addresses what I hope will soon become a moot point in School Board deliberations before the November 3rd election. Here it is title and all. Posted on Oct 22, 2015 at 9:40 p.m. 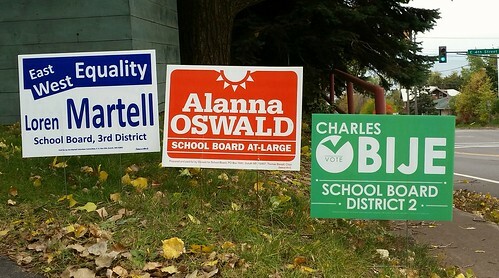 It is important to point out the inaccurate information that was in the Sept. 22 story, “Duluth School Board saga ends with lawsuit’s dismissal,” and in the News Tribune’s “Our View” editorial the following day, “Board, district can recommit to cooperating.” Both concerned the Duluth School Board majority’s abandoned attempt to remove me from the board. Though rich in political innuendo, the effort to overturn my 2013 election failed because there were no grounds to remove me, no intimidating behaviors revealed and no conflict of interest. Unfortunately, this legal issue cost about $250,000 and resulted in nothing but hard feelings, more angst toward our schools, and more money diverted from education. Fortunately, three board members who spearheaded this political fiasco decided against running for re-election. None of the six School Board candidates up for election stated they would have pursued such action. This is a hopeful sign that the health and integrity of our schools once again will be talked about at School Board meetings. The writer represents the 4th District on the Duluth School Board. The Trib has a good summary of our Mulch Meeting last night. This morning I read a short article in the NY Times that related to our relationship with the environment. The first was on a peanut product made in Israel called Bamba which everybody eats and most from a very early age. Someone noticed that there are almost no peanut allergies in Israel and wondered if there was a connection. Of course, I don’t recall hearing about peanut allergies when I was a kid although I remember some horror stories about milk products. Today, according to the article, one in 50 US kids suffer from peanut allergies. A study confirmed that children whose parents rigorously kept them away from peanuts as infants and toddlers were far more likely to have children with peanut allergies, sometimes deadly allergies, than parents whose children ate peanut laced products at an early age. Of course, peanuts are not the same as PCBs (poly chlorinated biphenols) and a host of other modern chemical creations such as those that can be found in tire rubber. There is no doubt our flushing of cosmetic and medicines down our sinks produces fish that all turn into females. We have a profound influence on our environment that is, at present, far beyond our ability to fully measure. So, I offer the following observations I made from last night’s meeting. Of hundreds of chemical compounds likely to be found in tires the dozen or so measured by a laboratory did not show anything particularly alarming. That said rubber, like wood chips, degrades over time. In the Lester Park school playground there is mulch from the equivalent of 12,000 tires. However, its much more worrisome than that. The shreds of tires are so small that the surface area of the rubber exposed to the atmosphere is factors above what 12,000 full rubber tires would be. Imagine an entire tire reduced to pencil shavings. Every atom in these tires is mere thousandths of an inch from the air. Its no wonder our kids come in with blackened hands. Kids aren’t very fussy about washing up after playing outside. Whatever is in the tires will be near our kids respiratory system for perhaps a thousand playtime hours before they go on to middle school. The bags of mulch from the manufacturer gives alarming instructions about washing up after contact with the bag’s contents to prevent worrisome things from happening. That’s an ironical warning on contents made for our children to play on. It will take a couple years before some much more extensive tests on tire mulch are conducted elsewhere. Meanwhile some urban school systems have forbidden the use of rubber mulch. Hauling off the mulch and replacing it with, oh say, wood chips is the least of our costs which might be $110,000. We might have to completely re-engineer our playgrounds by digging them deeper with new drainage systems and re-installing all the equipment or buying new playground toys. This is just the sort of issue that requires a functional school board to deliberate on calmly. The controversy is only a month old. It could fizzle out or ignite. An unnecessary repair would be expensive but it might offer peace of mind. That peace of mind could end up being as unwarranted as the calm it affords parents who keep their children away from peanut butter in the early years of their lives………or we could discover, years from now, that we subjected our children’s immune systems to substances that could cause long lasting and irreparable harm. The Trib only mentioned one item from our school board meeting last night – the sale of a small parcel of land adjacent to the Rockridge School for one hundred thousand dollars. That will pay for three years of heating and maintenance on the empty building should we be unable to sell it. Along with the unsold Nettleton School and Central High its one of the Red Plan’s many albatrosses. We sold Lincoln School for a dollar. That was our lucky day. Last night at the Board meeting when we discussed the many enrollment difficulties both Rosie Loeffler-Kemp and Annie Harala emphasized that it was the role of School Board members to speak positively about our schools. How they square that with the terrible public record of the School Board over the past year and a half I’m not sure but I do understand the impulse, ignored though it has been. Annie suggested another way to bring back students. Hiring more people to promote the good things about the school district in addition to our current PR person. Perhaps had we had two such folks they could have masked the antagonisms of the School Board last year and kept us out of the public eye. We might have to list among the qualifications for the job demonstrated previous experience with sainthood. We had a reasonably calm school board meeting tonight but it left me with many questions. It was nice to see David Kirby at a Board meeting two weeks before the election. Its the first time I recall seeing him here. He sat with Nora Samstad who made it through her first full meeting. It was a pretty short one, only an hour and a half long. Art made a motion to add a policy item to our agenda. He had brought it up to our Board and Chair Seliga-Punyko six weeks ago but the Chair refused to let it be discussed. This is a problem because our rules require a unanimous vote to get anything on the agenda on the day of a meeting. Not surprisingly it was two votes to five to deny Art and me a chance to explain the proposed policy’s merits. It simply said that important information would be shared with the School Board in the future. Then, at the end of the meeting, Art mentioned the recent loss of another 200 plus students. He showed a chart with all the losses and gains in students since 2005 to the present. There was a spirited discussion which was split. One side felt the discussion hurt our reputation with families. The other, minority, side felt that we needed better information to figure out how to stop the continuing loss of students. I mentioned that I’d like to conduct exit interviews. To my astonishment one of the majority members said we’d discussed exit interviews three times in the last year. I was too dumbstruck to ask what we learned from them having no recollection of any such discussions. I learned another fascinating imponderable today. Apparently only 40 percent of the families who appealed a decision to preventing their children from attending schools in different attendance areas got their wish. Last year it was 90 percent. I was shocked to hear this because I was appointed to serve on the Transfer Appeals Committee which makes these decisions. I was never notified of its having met all spring. This information was shared with folks at the meeting called by Rep. Simonson to discuss the Edison schools and its impact on the ISD 709 Schools. Supt. Gronseth offered up this information much as he suggested that ISD 709 will only lose about 200 students to the new 600 student Edison High School. Maybe we should be doing some pre-exit interviews to make sure. Annie Harala was the insider Board member who attended the meeting with the Superintendent. When the discussion of the new Edison High School came up Annie asked the Edison folks if they would put an end to the project for the good of everyone. She was informed that the project was too far along to stop. This is one time that “better late than never” doesn’t apply. Art Johnston sent the local press the worrisome news that ISD 709 has suffered another significant drop in its October attendance. He’s a little surprised that no news source has mentioned this, as of yet. The Duluth Public Schools disclosed to the School Board on Monday our enrollment figures for this fall. This showed another large, unpredicted decrease of students and raises lots of concerns. The Duluth Public School enrollment for the start of this year is 8366 students in grades K through 12. Today’s Editorial Page had a op ed about our playground mulch. A meeting is to be held at Lester Park this Wednesday at 6:30PM to give the Board information about its chemical composition and potential threat to children playing on it. Gary Glass gave me the name of one of his old EPA lab colleagues who did a little research on this subject a year ago after his grandson came home with black hands. I passed his name on to the parents who are concerned about this issue. So a little more on the campaign front to keep folks interested. I spent yesterday morning finishing up the last few homes on Park Point. It was a lovely day and I found willing takers for Loren Martell and Alanna Oswald signs all the way to the end of the Point. In the afternoon I tackled Arlington Avenue. Signs fairly few out of my car. These folks have not forgotten Central High’s fate despite many calls by Red Planners to Move forward. At one home a burly young man asked me what happened to his East High. He had been gone to the service for a decade and was astonished to discover what had happened to his old alma mater. His reaction was the same as many others. Why was the high school located in his old junior high? At the end of the day I stopped by the candidate’s forum at the School Board Room for a couple minutes. Denfeld and East students organized it with a heavy emphasis on the minority students who have fared so poorly in our schools lobbing questions at the candidates. I only stayed for one round of questions but thought Alanna’s explanation about the importance of school to her must have rung true with the students present. School was her home away from home. All the cuts to our schools since her graduation make that more problematic today. Perhaps the most notable thing about Alanna is her deep knowledge of just how things operate in the schools. She recently got the master class schedules for Duluth’s two high schools and poured through them to make comparisons. She hasn’t shared her study with me but at the forum she pointed out at least one of the differences to East’s advantage over Denfeld. There are many more. I asked her to send me a summary of her discoveries. Much more on this in a day or two. Here’s the Trib’s story on the forum. There will be another candidate forum tonight at Myers Wilkens Elementary School at 5. Alanna Oswald was in my classroom when teacher/astronaut Christa McAuliffe lost her life shooting for the stars. The next year Oswald’s mother committed suicide. Denfeld’s teachers wrapped Oswald in a cocoon of caring and launched her, one of the first in her family, to college at Gustavus Adolphus. There was no way Oswald wouldn’t become a teacher. I begged Oswald to run for School Board more than a year ago before our board plunged into a year of darkness and dysfunction. Oswald had just accomplished something that outshines everything our entire board has managed to do. She did it as a mom. She got Minnesota’s Department of Education to clean up Duluth’s long-neglected curriculum when she discovered that her fifth-grade daughter wasn’t being taught science or history the same way as children in eastern-Duluth schools. The motive was commendable. Her daughter’s school was desperate to escape Minnesota’s lowest state test rankings but did so by jettisoning a complete education. Oswald knows there are better ways to fight poverty. In 1987, I wrote in Oswald’s yearbook that she was a lot smarter than me. She still is. We need her, I need her, on our School Board. The writer is an At Large member of the Duluth School Board.